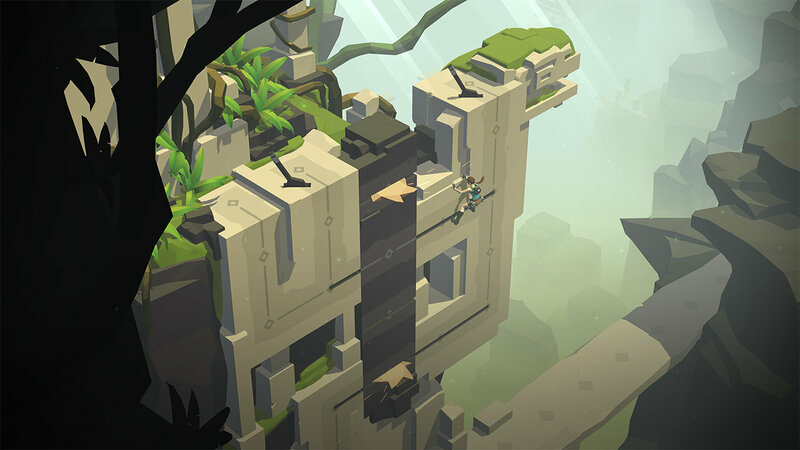 One of my favorite iOS games of last year was Lara Croft GO. 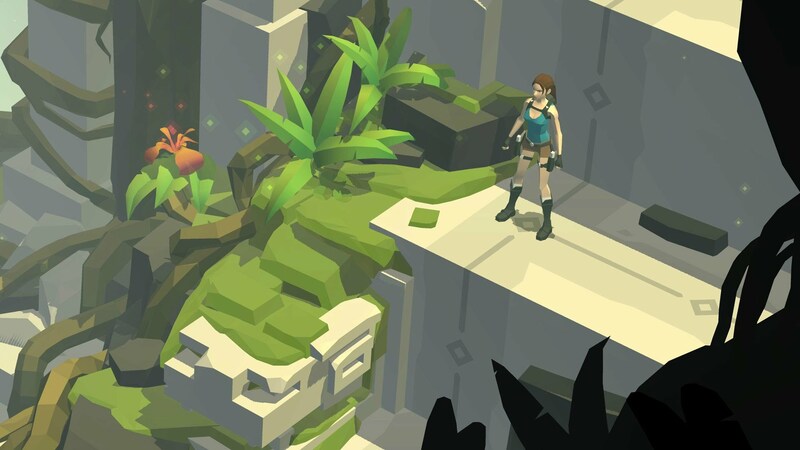 The isometric turn-based puzzler packs some excellent brainteasers as Lara attempts to work her way through a series of hazard-packed ruins in search of treasure. A couple of weeks back, the game made the jump to PS4/PS Vita thanks to collaboration between Square Enix and indie studio KO_OP. I talked to Antoine Routon, Lead Engineer and Co-creative at Square Enix, and Bronson Zgeb, Director of Design at KO_OP about the process of porting the game, and designing its exclusive new chapter. How did you conceive of the new gameplay mechanics for the new chapter? Bronson Zgeb: "When Antoine approached us, we had to stop and think about what we could do as a celebration for the 20th Anniversary of Tomb Raider. One thing that occurred to us simultaneously was remembering the manor from the second Tomb Raider game, and that was the jumping off point for this new chapter." "The story of the new chapter is that Lara receives a new artifact that she's placing in her trophy room, and in doing so sets something off. The artifact itself is a mirror, and it shatters, and shatters the world at the same time. It also splits Lara's body from her spirit. The story arc of the adventure is that Lara is chasing down her spirit to try to recombine together back into one, and while doing so she's traveling through a shattered world that's a reimagining of the manor on a void-scape atop a weird world." 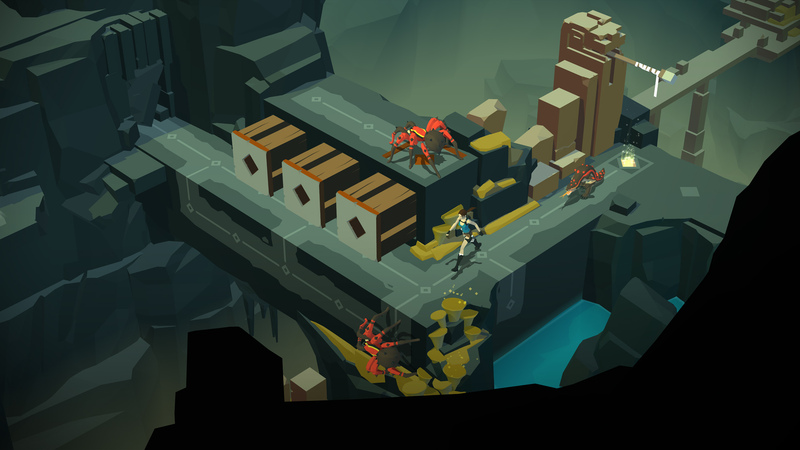 "I designed three new mechanics and used the endgame of the original iOS release as a jumping-off point. There are these eyes that appear in Lara's manor that shoot a beam of light in front of them. If you step in front of the light, it acts like a trigger or push-plate. Sometimes you need to step in front of them, and sometimes you need to block them with pillars and boulders." "The way they function is that if anything living steps in front of them, they get triggered, so you can also use enemies to trigger them. I then took that same idea and attached it to pillars in the world. Now it becomes interesting, because you have a trigger that you can push around. Then the big one is that because Lara's spirit and body have separated from one another, when you progress through the game you re-meet your spirit, but at opposite ends of the map. What happens is that the two of you move symmetrically, so if you make a move, then the spirit moves in either the same direction, or a mirrored direction, based on the mirror plane between the two forms. That makes it like you're solving two puzzles at the same time, because you have to keep them both in mind. If one can't move, the other can't move." Antoine Routon: "It's a really cool effect. You can actually cross paths where the normal Lara goes into the spirit world and vice-versa to solve some of the puzzles." How did you design the puzzles? Did you start with a solution and work backwards to the start of the puzzle? Or did you think about the puzzle as a whole? Or did you start with designing the puzzle from the very beginning and then work out the steps where you want Lara to go? BZ: "All of those, depending on the puzzle. When I first started, obviously I'd never made a GO game before, so I didn't know how to make GO puzzles. So within the first few weeks, I went and created at least 100 different puzzles to figure out how to make them, and work out how these different elements interacted with each other – what works, what doesn't work, what feels good. Doing that helped me discover my process, which is a combination of all the things you said." "There were times when I thought about a theme – I want a puzzle where you're managing the state of a certain object. Or there were puzzles where I'd start with the last step, and work my way backwards by adding layers on top of that while being aware about every time you add a layer. You don't want it to be a completely linear decision where you just do this, then this, then this. You want to think, okay, what can I add here that would add multiple choices – but not too many. If you have too many choices, then players get confused and frustrated and don't know how to proceed. You have to maintain a reasonable decision tree so that it's fun." Where did the idea for the spirit puzzles come from? AR: "I remember one of the artists did some sketches of a ghostly version of Lara, and that got us thinking about the idea for two Laras, and them possibly being linked. Initially it sounded like it might be too complicated because if they were completely separate, there would be too much to keep in mind. But then we thought of linking their moves symmetrically, and that made sense. It simplified the problem a little bit – and then we thought about it being a mirror, and it made sense." BZ: "We had an art director and myself as the design director and programming, and on top of that, we brought in our musician to do a completely new original score, and then we had a producer on each side, and one extra artist." AR: "Our original team was small - we were between five and twelve people at most for the original game. KO_OP was about four on average. Super-impressed with what they managed to do with so few people. I guess that's the thing with small teams: You scope appropriately, everyone wears many, many hats and is able to do many things. All these things are values that we share and we identified that very early, and we trusted that we would get there." "What's interesting to me is the collaboration between Square Enix and an indie studio. The way I see it is that the barrier for entry for creating games used to be very technical – it was really hard. But with tools like Unity and even Unreal, it makes it easier and it's more of a creative exercise, like how are you going to bring the level of creativity, innovation, and art direction to make things really beautiful." "As a company, at Square Enix, we need to understand that maybe some of the super-talented creative people already have their own structure. Teams like KO_OP, for instance, function like a collective of artists, and we need to be open to find the talent there, and find new ways to work with people. 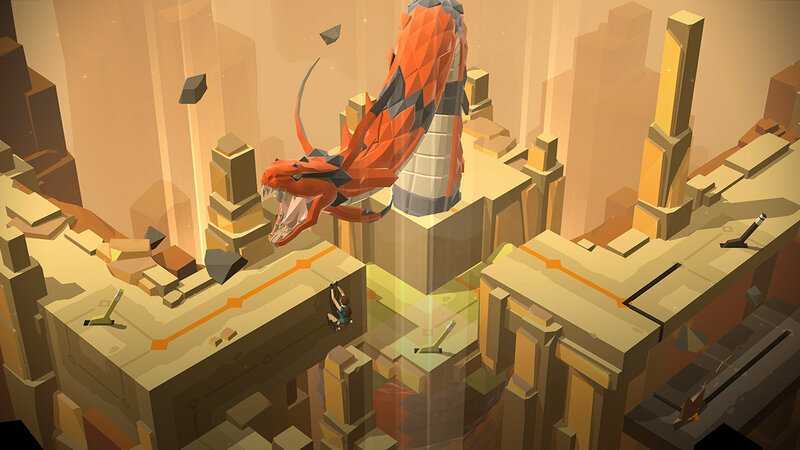 A collaboration like the one we did with Lara Croft GO is a nice way to go about it." How did you end up picking KO_OP for the project? AR: "I saw GNOG at PAX, and the game really stood out for me in terms of its art direction. 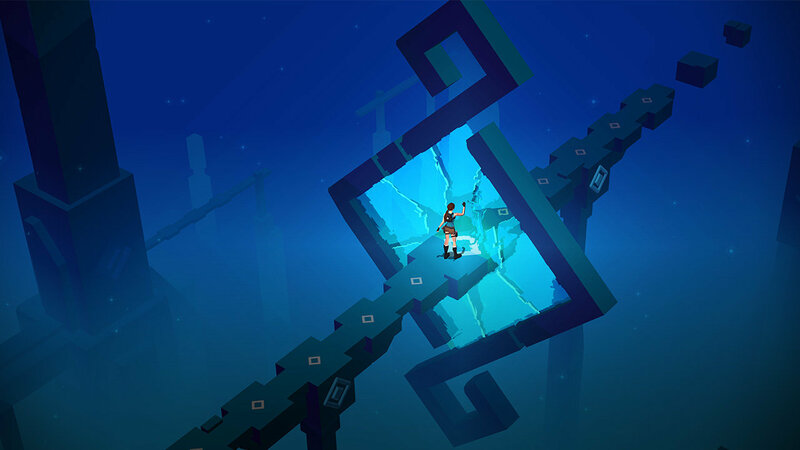 It's a really nicely handcrafted game with a cool art direction. I kind of related to that. The fact that we're both in Montreal also really helped. It's nice not to be remote, and to be able to meet in the same office to talk about things. But the cornerstone was to be able to have a beer and talk things through. Just make sure everything's fine, and on a personal level that worked really nicely, and let us build a really good relationship that goes beyond this project. In the end it's a human adventure. It always comes down to people." "We do have this AAA heritage being Square Enix, but we also have this almost indie sensibility. I think being focused on mobile initially helped with this. Our scope is very focused. We're not 500 people. Being small, being focused on handcrafted product, we can maintain this very human side to it. Personally, I used to work on the AAA side of the industry, and what really excites me about working on a smaller product or a mobile game is that human dimension. It's super-exciting to me." BZ: "As an outsider, visiting Square Enix and starting this collaboration, it felt like we fit in immediately. They way we work, and the way they work felt very similar. The whole collaboration lasted about six months, which is a very tight timeline for something like this." AR: "At the beginning of the project, KO_OP spent a lot of time at our offices. Then there were a couple of months, once the project was established, and it was more about iterating, where we worked more remotely and visited every now and then. Then at the end of the project, there was more of a rush, and KO_OP moved into the studio to close the game." What's next for the GO team? AR: "For us at Square Enix in Montreal, we've just finished a cycle – we have Hitman GO, Lara Croft GO and Deus Ex GO – the big Western franchises. I think it's important for us not to only be the GO studio, so we're definitely working on new projects. Having said that, it's also really fun working on GO games, so never say never. And also it was really, really fun to work with KO_OP, so we're also looking to see if there's something we can do together in the future. We have some projects that are in production, and we have new leads as well – it's a good time to be looking what new opportunities we might have."